Share "Raising Baby Chicks Can Be Easy, Even For The Inexperienced"
Many people are opting to raise their own chicks these days. It’s a rewarding experience that can leave you with the freshest eggs on the block. If you’re new to the baby chicks game, then this article is for you. Raising chicks doesn’t have to be hard. With the right space and equipment along with proper care raising baby chicks can be easy, even for the inexperienced. Before taking the plunge, make sure you have the resources and approval to raise baby chicks. This means having the time and money to take care of them long term. In addition, check your local regulations or home owner association rules to ensure you’re permitted to start a coop. Every community has different rules or regulations towards keeping chickens. Double check your local area’s rules to avoid any fines or consequences. Like any other household animal, chicks require food, water, and shelter. Get started by visiting your local farm store and grabbing 3-6 chicks. Don’t just get one. Chickens are very sociable creatures so make sure to get enough so that there’s always someone to play with. Like Andy Warhol said, ‘one's company, two's a crowd, and three's a party.’ It’s also good practice to have more than one bird should any fall victim to predators or disease, which can decrease your yield. Hens will typically lay 5-6 eggs a week. Therefore, having at least four birds will provide you with close to two dozen eggs per week! To shelter your chicks when you bring them home, start with a brooder. A brooder is short for heated house. You can purchase a brooder from your local outdoor supply store or build one out of a cardboard box. If you’re just starting out, I recommend using a cardboard box because it’s a cheap and effective alternative. You can also use a small plastic or glass container to provide food or water to your coop. As long as the brooder is tall enough to keep them from getting out and big enough that it has enough space for the whole flock, it will be fine. Until the chicks are full grown and have all their feathers, you’re also going to need a lamp to keep them warm. Though most people opt for a heat lamp, a regular 100-watt bulb will also suffice for providing adequate heat to your birds. Always keep fresh water available for your chicks. Furthermore, make sure there is adequate feed available for them eat. Feeding baby chicks is simple. 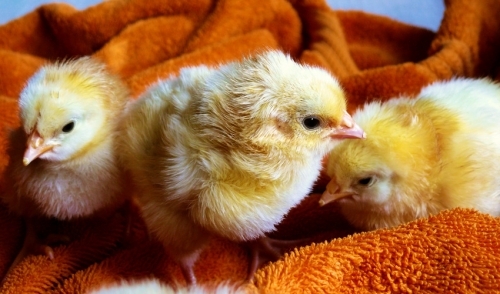 Baby chicks eat food called ‘crumbles.’ It comes medicated and un-medicated. I recommend the medicated version as it helps prevents Coccidiosis which can cause death. Chick crumbles is a complete supplement, so you won’t need to feed your chicks any other food except treats here and there during playtimes. The final point about raising baby chicks is to always maintain their cleanliness. Just like actual babies, these babies are susceptible to a variety of diseases which are easily avoidable if the brooder and water are kept clean and fresh daily. After about two months your chicks will be ready move outside into a coop where they will thrive and provide for both you and your family.